It's been a very busy couple of months at SwitchDoc Labs (see the "Two Projects" box), and the common theme has been the Internet of Things (IoT) and how to build projects for it. Given that my head is really into IoT at the moment, I thought I would build a small IoT project for the Raspberry Pi and share the experience. 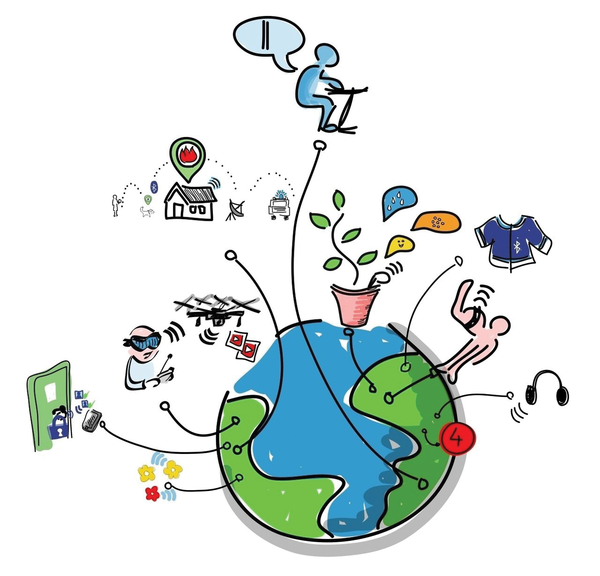 The IoT is a network of physical objects that contain electronics, software, sensors, and some kind of network connectivity (e.g., WiFi or Bluetooth on the Raspberry Pi) that allows these small sensor-laden devices to collect data, exchange data, and, in some cases, do things in the physical world (Figure 1). Although the IoT is surrounded by a huge amount of hype in technical circles, there is no question that you will be seeing a lot more about the IoT in the next few years. Figure 1: The IoT connects you to physical devices. 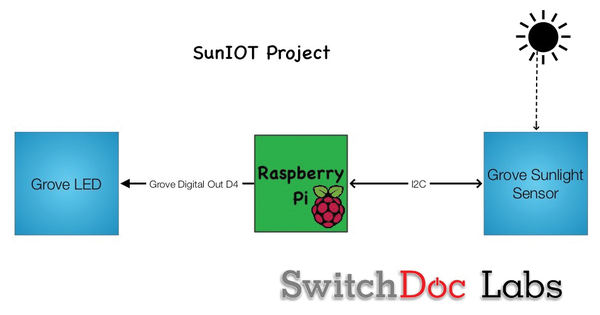 The SunIOT project is based on the Raspberry Pi 3 (RPi3), although you could really use any Raspberry Pi for this project, but because the WiFi is built in, this is a good version to use. The overall design of the project is simple. The Raspberry Pi reads a sensor that measures sunlight and breaks the sunlight down into three components. It also provides visual feedback with an LED that a sample is being taken (two blinks) and that the process is still running (one blink). The general idea of SunIOT is to build a software platform on which to build more complex IoT sensors (Figure 2). Figure 2: SunIOT block diagram. In this column and the next, I will be going through a complete, albeit simple, IoT design. Detecting oxygen with an Analog to Digital Converter. We hook up a simple IoT device that detects the concentration of oxygen and push the data to online dashboards so anyone can monitor it..
We hook a simple IoT device up to a couple of IoT Dashboards on the Internet so that everybody can see what’s going on.